Not very long ago I was running around barefoot at my parents house. It’s always fun to chase Joe in the grass around trees and great outdoor smells. I ran past this tree many times. Upon closer inspection I hoped to find many of these. 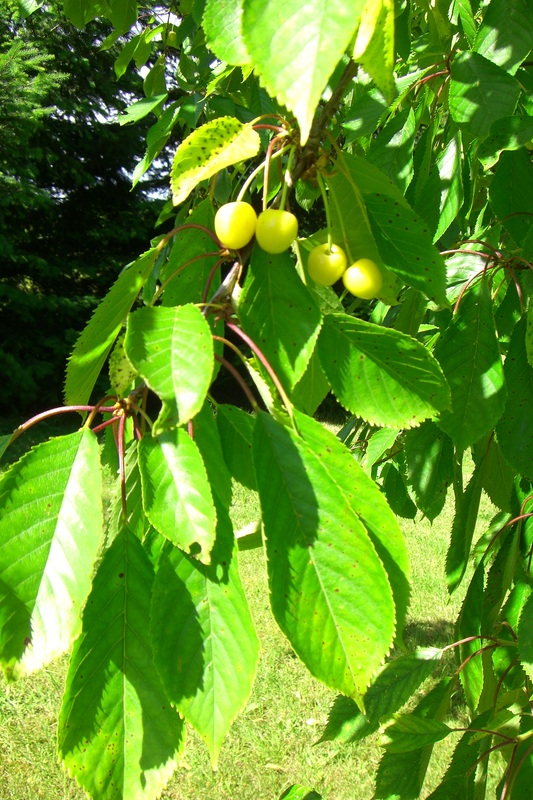 The cherries are starting to fill the tree but were not quite ready for picking yet. 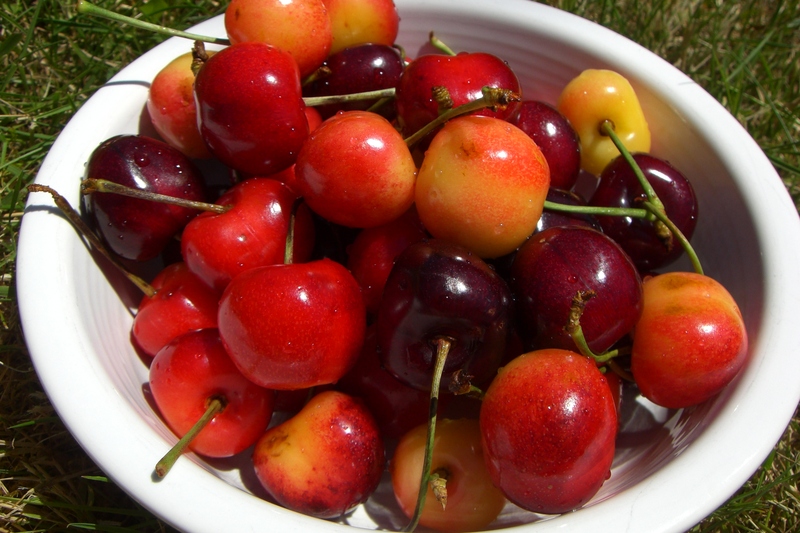 I settled for delicious rainier and bing cherries from the farmer’s market instead. I love eating cherries but was also super excited to try out a new gadget that was sent to me from Talisman Designs. The Cherry Chomper! Isn’t it cute? The cherries go in the mouth, you push down on the head, the pit gets pushed down into the clear container beneath the mouth and the pitted cherry stays in the mouth. After a few attempts I finally got the cherries in the right position so I only had to push down once to de-pit it. This cherry pitter kept me much cleaner than my other one I have, especially when pitting the dark red bing cherries. Want to win your own Cherry Chomper? Check out Talisman Designs website and leave a comment telling me how you would use one of their creative products… like the Flip’n Good Measuring Spoons or the Pick n Dip Kits. All of their products are super cute so check them out. 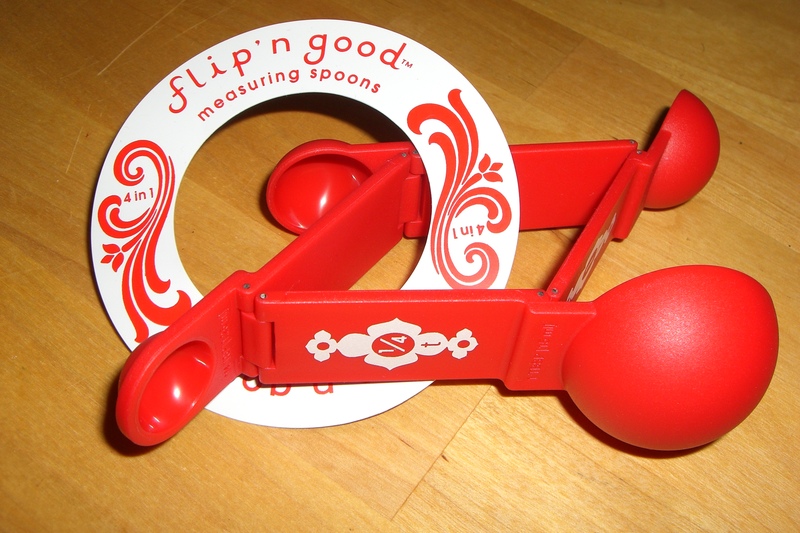 In addition to the Cherry Chomper I was also sent the Flip’n Good Measuring Spoons to try out. They will be perfect for camping. Super easy storage and all 4 spoons easily stay together. The giveaway will be open until Sunday, July 11th so hurry and check out the site! Spread the word and leave a comment letting me know you did for an additional entry. Wow! They really do have super cute things! That cherry chomper definitely beats stained finger nails for a few days after pitting your own! I definitely think the butter girl/boy are cute and a better way to spread butter over corn without making a mess. The pick-n-dips would be great for get togethers.. everyone gets their own pick for the night and you don’t have to worry about spreading germs! Plus they’re sparkley and cute! Tired of stained fingers after pitting cherries?! Here's a chance to win a CUTE Cherry "Chomper" – Click here: http://tinyurl.com/24rjjc9 !! Your parents have a cherry tree! I’m jealous forever! 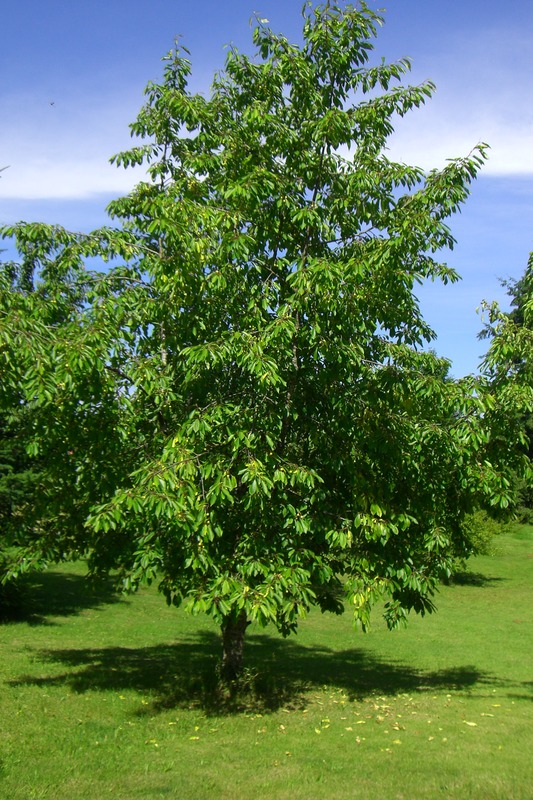 If I ever have a big yard (which I don’t really plan too bc I’m such a city kid) I am having a cherry tree. I’d love those measuring spoons! So clever! I love the measuring spoons. I never seem to keep mine together and one way or another misplace the one I always seem to need. I love how they attach. Too cute! The cherry chomper looks really good. Nice to have to i can remoce the pit and freeze some cherries for later on. I love finger foods and those toothpicks are perfect! The cherry chomper is DARLING!!!! First of all congratulations: I really like the new design of your blog. Please sign me up to win one of these adorable cherry chompers. Talisman has a great line of products. I like to decorate my table and I think the Gem Light Party Picks are really beautiful!